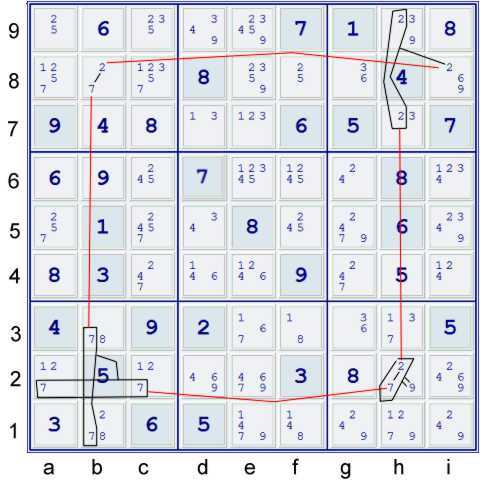 The Tough Sudoku of August 11, 2010 contains another reasonable teaching moment on how one might combine smaller almost continuous networks or loops to form deductions. 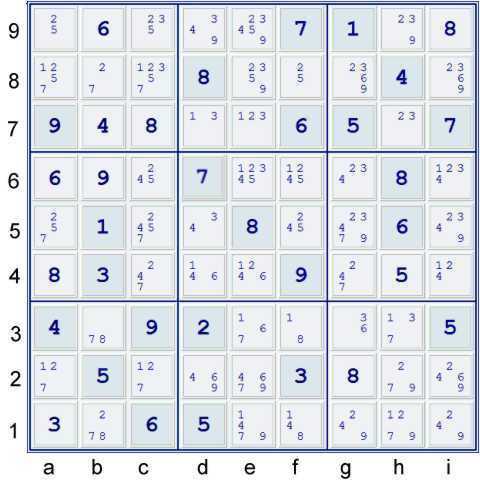 A continouous network or continuous loop is not only a powerful Sudoku technique, trick or tip, it also is my personal favorite type of sudoku deduction.. Note that although much of the stuff we will analyze is available without this next step, it is hard to pass on one that is this easy. 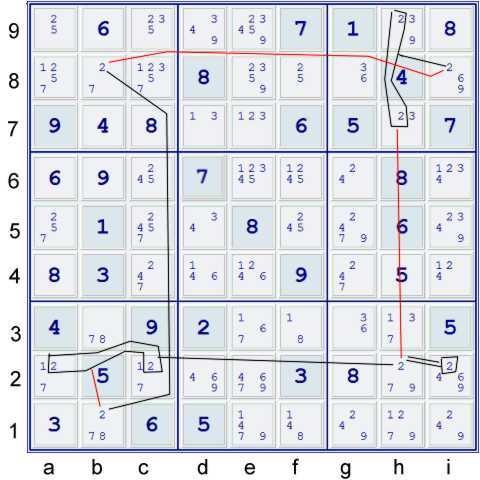 It is quite likely that one can find a path to solve this puzzle without the next step. IMO, the former is easier to find. Some, however, have a fondness for the latter. In such a puzzle, the two must co-exist. Thus, one might say they are equivalent. Please note that what follows is available without the YWS. 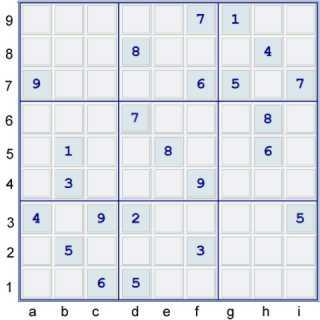 However, I do not believe the puzzle solves without some similar additional step. Below, looking at AIC's which do not eliminate anything but are instead Almost Continuous Loops (ACLs)can unlock the puzzle once one finds how to combine them. I shall include three rough diagrams of some of the ACL's at the end of this blog page. The following AIC's which are also ACL's are available. Note additionally not only the logical symmetry of some of these, but also the actual puzzle symmetry. IMO, these symmetries make the following relatively easy to locate. The next two items are Almost WWing Rings. They should be self-explanatory as two halves of Almost WWings - which are a type of YWS. Regardless of the preference in presentation, IMO finding the step is served well by looking at ACL's. Although this particular manner is more complex in expression, I find the symmetry that it exploits to be especially pleasing to the eye and brain. It also serves to emphasize the process of finding the elimination group, since it maintains the ACL's that one can locate and exploit. In summary, I believe strongly that ACL's are extremely well used as ALS's and some more typical forms. However, I believe that their utility in other forms such as those shown above are not as well utilized. They deserve some greater study, IMO. 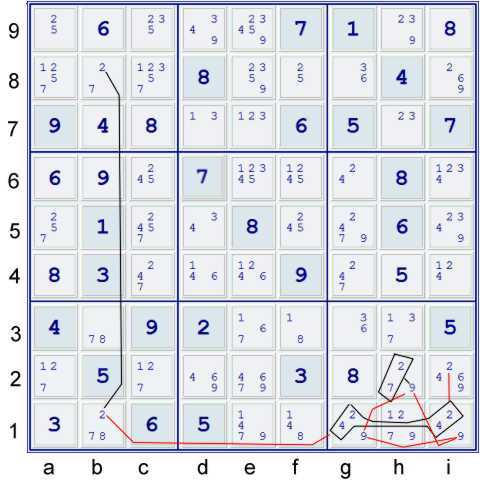 Below, find what I think to be the primary Almost Continuous Loops that can unlock this puzzle. Since one of the WWing ACLs is shown, I trust that the other need not be shown. The ALS above includes some link information. You lost me on the first step. I can't make see the logic in the YWS technique either here or where it is introduced in this blog. I also have no idea what an argon is other than a gas. Correction, now I see the ALS-XZ elimination. I misread agon as argon. Sorry.